One essential element of Bus Rapid Transit (BRT) is the communication of real-time information to transit riders. Knowing when the next bus will arrive will provide a better overall experience for passengers while giving them the information they need to better plan their time before the bus arrives. How that information is conveyed can be done a variety of ways, each of which provides a different means for the passenger to understand how their wait time could be spent, or even minimizing that wait time. If a passenger knows when the next bus will arrive they can better plan their trip to the station, make better use of their time at or near the station, or have the confidence that the bus is actually coming – eliminating the anxiety or boredom that can come with waiting for a bus. As an example, if a passenger is able to access real bus arrival time from his or her home or place of work, they can better plan for when they need to leave for the bus and minimize the amount of time waiting at the station. This is especially useful in cities like Omaha that have extreme weather conditions (too cold or too hot), or when trying to maximize the amount of work that can be accomplished at the office before leaving to catch the bus, or when planning a hectic morning before leaving the home to head to work or other destinations. 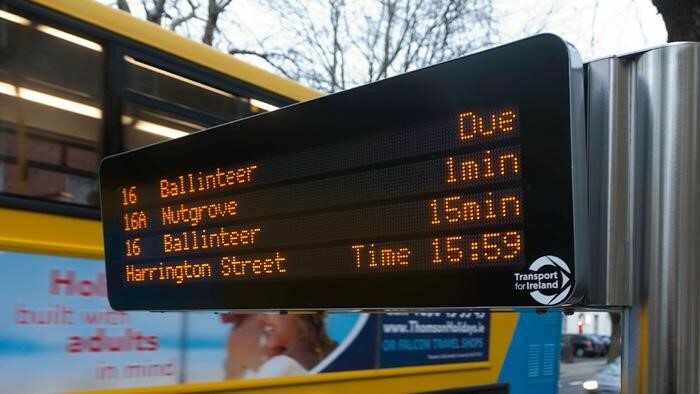 If a passenger knows the next bus arrives in 6 minutes and they have a 5 minute walk to the station, they can plan to leave their current location 5 minutes before the real-time arrival of the bus. At the same time, a passenger who has arrived at a station and learns that the next bus is arriving in 2 minutes might choose to stand and wait during that short time period. A 5-10 minute wait might allow that passenger to choose and sit on a bench and dive into the New Yorker or Economist, while a 10-20 minute wait could allow the passenger to contemplate other travel options depending on the number of stations to be traveled and urgency of arriving at their destination. If the next arriving bus is in 15 minutes and one’s destination is only one station away they may choose to walk or ride a bike from the bike-share station at the station. Or if the next next bus is in 20-25 minutes due to the bus being held up in traffic, individuals might hail a cab or request an Uber if their schedule won’t allow that long of a wait, or go get a bite to eat.How the real-time information is conveyed can vary. At the most basic level, each station along the travel corridor should include digital displays communicating when the next bus will arrive, supplemented by clear and audible digital audio messaging conveying the same information throughout the station. This same information is useful for passengers on the bus, but telling them what the next stop is, especially so new transit riders or visitors from out of town unfamiliar with the city know when their stop is coming. The same information should be available on a well-designed app on a smartphone, or web interface, so passengers can track the arrival time of buses from their work place, home, or other location, allowing them to plan their departure time for the station, or make other plans to get them to their destination depending on the circumstances. The same app could and should also provide the same real-time information for other transit modes (basic bus) that might be required for a passenger to begin or complete a trip outside of BRT corridors. The Institute for Transportation & Development Policy (ITDP) includes providing passengers with information as a grading criteria in The BRT Standard, an evaluation tool used to establish best practices for BRT. Up-to-date static passenger information, which includes network and route maps, local area maps, emergency indications, and other user information is awarded one point, while functioning real-time and up-to-date passenger information via electronic panels, digital audio messaging, and dynamic information on handheld devices is awarded two points. Mode Shift Omaha believes the planned BRT corridor in Omaha should provide passengers with the highest level of current and future real-time passenger information ensuring Metro’s customers have the best overall experience possible, while also demonstrating Omaha has the potential to provide a world-class BRT system. My hope is that decision discussions around real-time information don’t move towards an app- or online-only solution under the guise of it’ll save upfront costs not incorporating this feature at all stations. I am only one person but I don’t have the technology to use app- or online-only once I have left my home or a free WiFi spot so I’ll be relying on real-time information at the stations; I suspect there are other in our community like me with similar technological constraints. And, for goodness sake, the “New Yorker or Economist?” For me try more like Us Weekly or In Touch. Thanks Amy, great points! Hopefully everyone using the BRT can have the info they need to read whatever they want, without anxiety, while they wait (not for too long) for the next bus :). do we have any sense yet of where things stand with the planning process and if the public will get a chance to provide feedback? what’s the value of “demonstrating Omaha has the potential to provide a world-class BRT system”? Dirk, We understand from Metro there will be several more opportunities for public input on the BRT process. We are trying to find out what the schedule is for this. Two of our board members are now part of the BRT stakeholder committee. Could you please expand a bit more on your second question? Thanks! ensuring Metro’s customers have the best overall experience possible” ? Thanks for your inquiry. In our view, it’s important to show that Omaha has the potential to provide a world-class BRT system because many Omahans will expect quite the opposite. We hope to elevate public expectations for what the BRT could/should be so that more folks are ready to advocate for a great system when tough decisions need to be made by those planning it. gotcha, interesting tactic and looking forward to see how it plays out, my only related concern is that by working within our means will we be getting something done that gives us a quality experience and yet comes up short of the sales-pitch as we don’t have the resources of really big/wealthy cities? fine line i suppose.